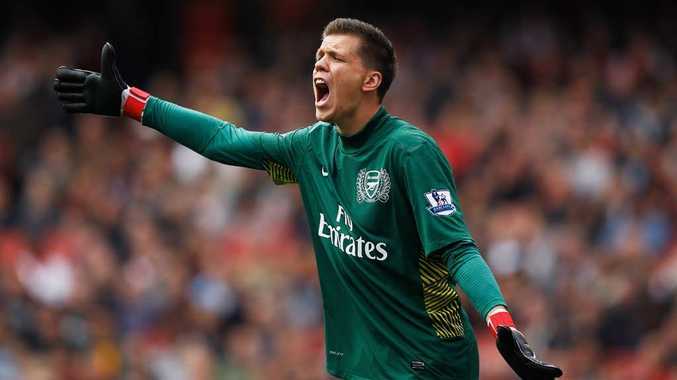 THE English players at Chelsea run the club, according to Arsenal goalkeeper Wojciech Szczesny. With yet another Chelsea manager sacked last weekend, having fallen out with senior players, Szczesny suggested the power was misplaced at Stamford Bridge. "I think some of the English lads at Chelsea run the club, pretty much," Szczesny said. "You know, they've had 10 different managers in the last few years." The situation, Szczesny said, was "a little different" from that at Arsenal, where the players were all behind Arsene Wenger. The Arsenal manager, though, was yesterday charged by Uefa with "improper conduct" for comments he made about referee Damir Skomina after Tuesday's Champions League exit to Milan. Szczesny believes that Chelsea will recover and hopes that they will relegate Tottenham Hotspur into the Europa League positions: "I'm sure Chelsea will pick themselves up sooner or later, but hopefully not soon enough to get in front of Arsenal. It's all in our hands now. We don't really look at any other teams. We're three points clear of Chelsea, if we don't drop any points, simply we'll keep the fourth spot, hopefully challenge Tottenham for the third spot. Ideally, we'd finish third and Chelsea would finish fourth." Szczesny said that he was pleased to play for a club where the manager was obviously in control. "We have a fantastic manager who knows how to run the club," he said. "We have the boss, and we know who is the boss in the dressing room, and that's Arsene Wenger obviously, and the skipper Robin van Persie, who is the leader in the team." Arsenal's recent improved form - they have won four consecutive league games - Szczesny put down to their faith in Wenger. "All the players believe in what he's doing," he said. "Sometimes things don't go our way, but we believe in the way the manager runs the club, the way we want to play football, and we know that even if things are wrong we're going to turn it around and win games, and that's what we've done in the last few weeks." After describing the dressing-room mood as "heartbroken" after their Champions League defeat by Milan, Szczesny said that Arsenal would flourish in the league if they could replicate that performance. "I think we should look at the positives from the game," he said of the 3-0 second-leg win. "We had a great performance, kept a clean sheet, scored three goals against one of the best sides in Europe. If we can take that into the Premier League, I think teams are going to struggle against us." Arsenal's next match is a league game at home to Newcastle United on Monday, and Szczesny was confident about their last 11 matches. "We are in a spot that gives us Champions League football next season," he said. "We shouldn't really look at the form of other teams. We should just try to win every game." Kieran Gibbs also believes the confidence has returned to Arsenal. "We had a difficult period with lots of players out," he said. "Everyone has come together. Now we have a bigger squad, which means we can rotate more and players won't be so tired and the team looks forward." The priority, from here, is to ensure that Arsenal are in next season's Champions League. Gibbs said that "of course" requalifying for Europe's elite tournament would help with keeping Arsenal's best players. Gibbs paid tribute to Alex Oxlade-Chamberlain, who was brilliant in midfield in the first half on Tuesday, but tired afterwards. "He didn't look out of place in midfield," Gibbs said. "He is a fantastic player. He's a great talent and is going to be an important player for us. A lot of players played their part but we just fell short." Gibbs claimed it was only tiredness which prevented Arsenal from overturning Milan and reaching the quarter-finals. Can Benitez beat the formula?